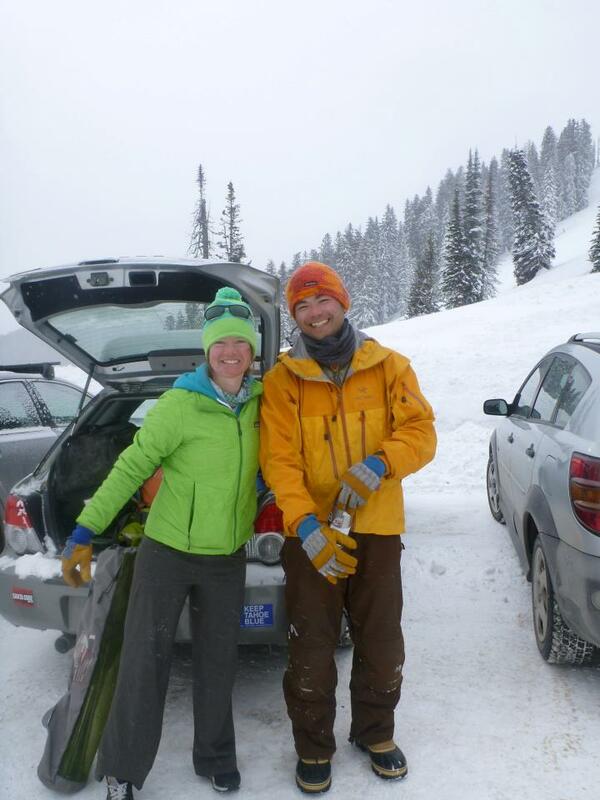 Jackson Targhee Trip and Blame it on the Season! | Meghan Kelly Teles! Jackson Targhee Trip and Blame it on the Season! After my dismal skiing performance at the comp, I was feeling a little down on my skiing ability. I could blame it on the season, or lack there of, that we had in Tahoe this year, which is definitely a factor – skiing groomers until January 21st doesn’t prepare you to ski in a big mountain comp. Still, others were able to perform with less than stellar snowpacks going into the comp, so blaming it on the season isn’t entirely fair. I’m pretty sure I’m just not a comp skier – maybe I’m just a “soul skier” as people say. I know I’m a good skier in good snow, but the fact that I ski in Tahoe, where the snow is usually good, and I have the luxury of flexing my schedule to ensure I get to ski the snow when it is best, paired with my love for backcountry skiing, may not give me the skill set to deal with more challenging snow conditions. Louise was an awesome friend during the comp. She provided lodging, laughs, and encouragement. Having not made the cut to ski in the finals on Saturday, I decided to head to Jackson to ski with Greg and Monica at the village. We awoke Saturday morning to snow showers. Getting the 2nd tram, we skied rendezvous bowl by feel, having absolutely no visibility until we found some trees to duck into. The winds meant that some chairs were closed and we ended up lapping apres vous and thunder lifts most of the day. It snowed all day and the quality was awesome. It was great to ski steep terrain with cliffs and chutes. I also finally got to put my new Moment PB&Js to work and they are a great Jackson ski – good for both untracked and cut up snow. By 2:30, most of the lifts had closed, and the lines on the few that were open were over 30 minutes long. We called it a day and started our Jackson apres – calling it a night early. 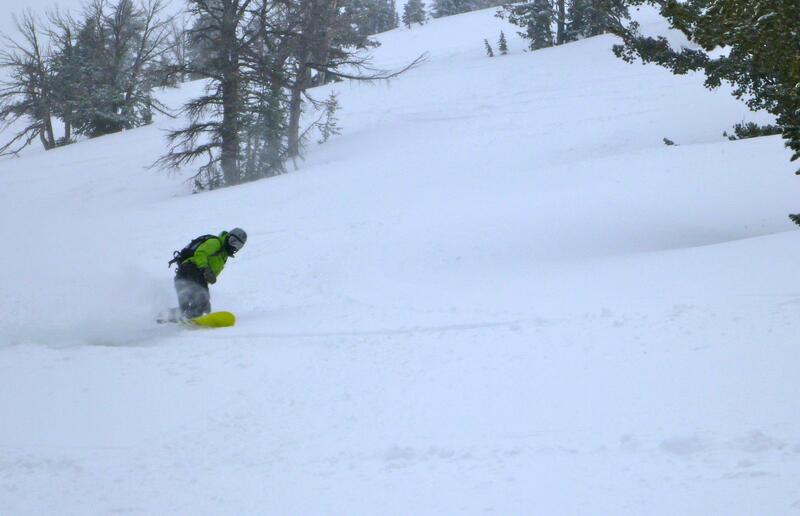 It was going to be a powder day on Sunday. The tram line was already over 100 people long at 7:15 AM! We got our skis in line around 7:40 and were in the 2nd Tram. I decided to drop Corbetts, which didn’t go too well, but the snow was awesome! It was going to be a good day! We skied powder all around Jackson that morning, Headwall hikes, danger cliffs, and a bunch of other places I don’t know the names of. I had a blast chasing Greg, Audrey, and Eric around the mountain. At 1pm I met up with Monica and the Jackson Hole Babe Force at the Tram. What a turnout! About 30 ripping female skiers and riders ready to charge! Check out this great article on the experience. 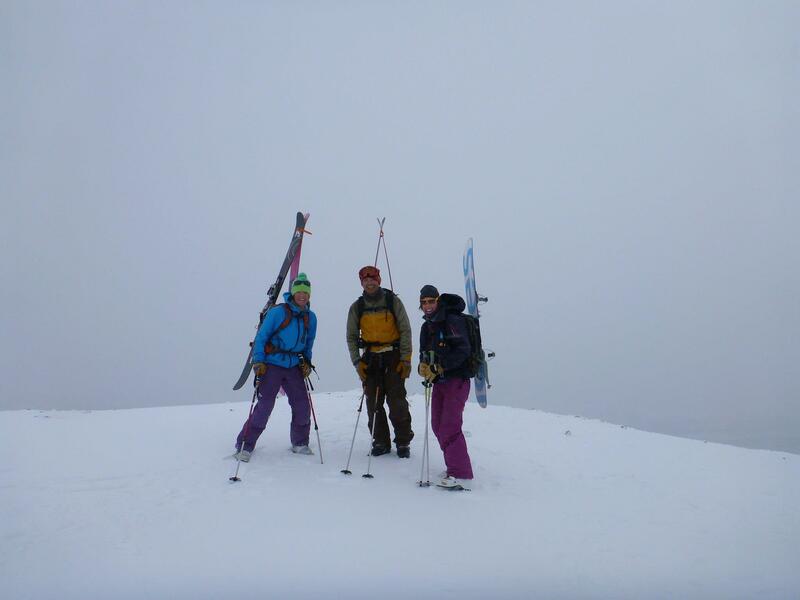 We skied a few hilarious runs and then Monica and I went out to check out the Jackson Hole Sidecountry with our new friend Michelle. I knew I needed to get back to Tahoe for work Tuesday, so I decided to hike Mt. Glory with Michelle the next morning and get an early start on the trip back to Tahoe. Glory is a classic Teton Pass hike and you boot pack the entire 1600′ hike. We were rewarded with powder skiing on the way down. Greg with a long way to go... Mt. Glory, Teton Pass. Jackson is an amazing place with vertical and terrain unmatched anywhere in the US… it was a little hard to leave, but knowing Tahoe was about to get snow made it easier. Headed back to Tahoe from the top of Teton Pass. Fun times in Jackson with Greg! Thanks to Greg, Michelle, and Louise for making this an awesome trip!